As my sister Heather and I travel within Quebec this week, I note a surprise within every hair-raising, lightening speed turn of our host’s, a former racecar driver’s, Hummer. We flew (by plane) Thursday into Montreal and flew (by car) to the small village of Nominingue, where we remained two nights on a lake (any lake, really, considering the proliferation), followed by two days in Quebec City, gawking like the tourists we are over the things we did not expect. Most important, we wondered why on earth, especially as Louisianians, we or anyone else bothers traveling to Europe. 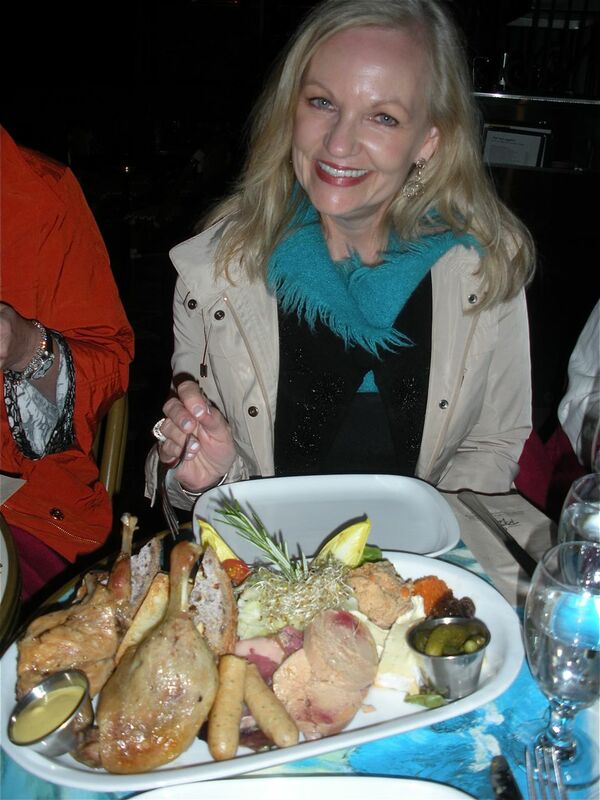 ...observed our traveling companion Cindy Doré Brunet, as we studied a 1926 painting by Gaston Hoffman (French, b. 1883) within the café of the Musee National Des Beaux-Arts du Quebec (tap photo to enlarge). Regrettably, I have no time to write about any of it today, as we spend our last hours in this area touring a castle, hiking a waterfall, and shopping for souvenirs (specifically, hand-made felt fingerless gloves and artist-on-the-fence type miniature paintings). Montreal tonight and a major post this weekend. 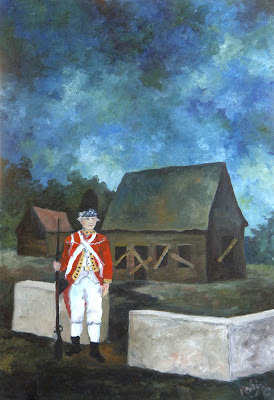 In the meantime, I leave you with a re-post of the images and story behind George Rodrigue’s Saga of the Acadians, a series haunting me as I roam these stone streets and reflect over a harbor that saw, in 1759, thirty thousand British troops enter for the last time. 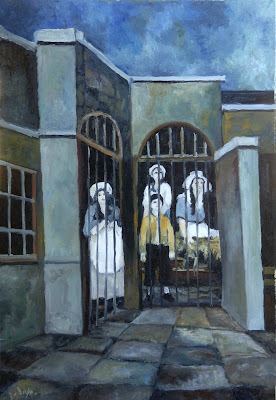 The series is on view at the Alexandria Museum of Art until July 2, 2011, followed by Baton Rouge and Shreveport (schedule here). 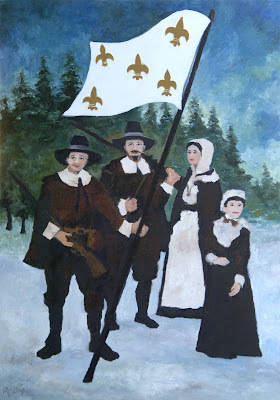 I also remind you to “Know Louisiana,” a tribute to our state and the Cajun paintings of George Rodrigue in my latest post for Gambit’s Blog of New Orleans, linked here. 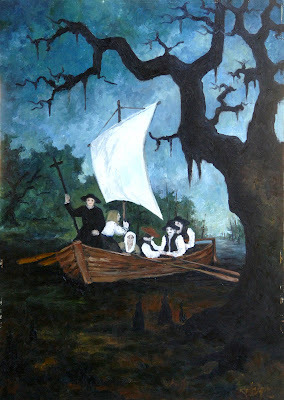 Between 1985 and 1989, George Rodrigue painted the Saga of the Acadians, a series of fifteen paintings chronicling the Acadian journey from France to Nova Scotia in the 17th century, from Nova Scotia to Louisiana during the Grand Dérangement of 1755, and finally the first official return visit from Southwest Louisiana to Grand Pré in the 1930s. I’ve written about this series so often over the years that I’m struggling to find something fresh for a blog. And yet maybe there’s no reason to approach the works in a new way. These are George’s graphic interpretation of the story of his ancestors, and perhaps the less analyzation the better. In 1984, the year before he began the Saga, George painted his first Blue Dog. 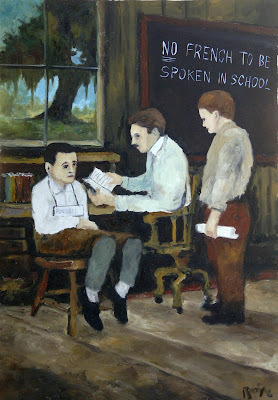 Over the next five years he painted not only the loup-garou, but also a number of important Cajun works and portraits, including paintings of Hank Williams and President Ronald Reagan, as well as the Saga of the Acadians. Many people don’t realize that there was a long crossover period of both Blue Dog and Cajun works. 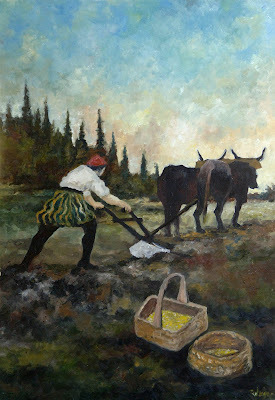 George narrowed the Acadian story down to fifteen paintings. He’s said many times that had he wanted to, the expansive saga could have been two hundred paintings. These works are painted in oil, completed just prior to George’s struggle with hepatitis, resulting in his switch to acrylic paint. He’s often mentioned the marathon pace of painting both this series and the forty canvases for the book Bayou as having brought on his illness. 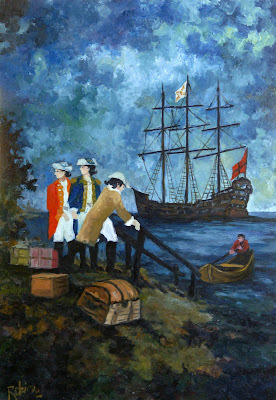 The paintings typify George Rodrigue's style, established years before with works such as the Aioli Dinner. The figures appear to be cut out and pasted onto the landscape, just as the Cajuns were cut out of Canada and pasted onto South Louisiana, where they started life again, making a home for themselves in the swamps and prairies. The oak trees are cut off at the top so that light shines from underneath, representing the small sky of Louisiana (as opposed to the big sky of neighboring Texas), as well as a distant hope for these transplanted people. Rather than shadowed beneath the trees, the people shine in white, glowing with their culture. 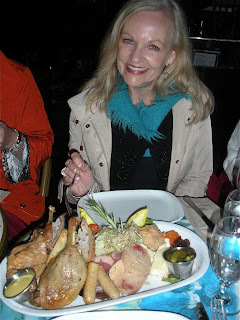 The Saga of the Acadians was originally in the collection of the Landry and Defez Families in Henderson, Louisiana. 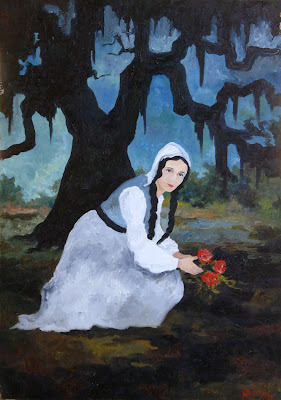 They donated the works to the Acadian Village Museum in Lafayette, Louisiana, where for ten years the museum housed a George Rodrigue annex, focusing on the Saga, with supplemental paintings loaned by the artist. 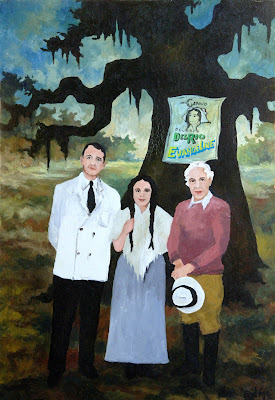 Eventually the Anne and Wendell Gauthier Family of New Orleans (by way of Southwest Louisiana) acquired the collection. Through their generosity the paintings tour museums throughout the state of Louisiana, focusing on small venues in Cajun communities. For a list of 2011 tour dates and locations, visit here. 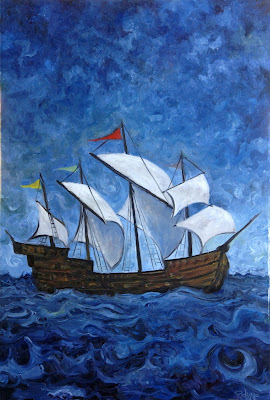 The Sailing of the Jonah depicts the beginning of a journey in 1604 from Normandy, France, to what is now Nova Scotia. This journey launched the beginning of an ethnic group destined to fascinate the world. 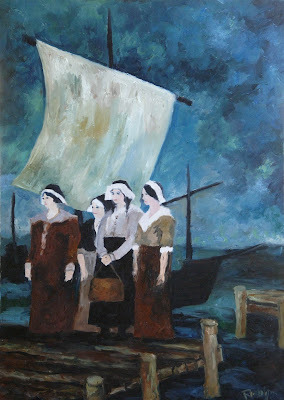 Pilgrims. 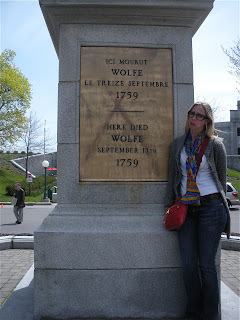 Frenchmen were the first settlers of the North American continent. Arriving just north of Plymouth Rock in 1604, they lived a family-oriented lifestyle in the harsh Nova Scotia wilderness. The First Planting. These imaginative settlers (now Acadians) developed fertile farmland in their marsh-like territory. So successful were their efforts, many historians feel the Acadians were deported in order to make room for British settlers who coveted these productive grounds. The Fight for an Empire. French soldiers board a ship just ahead of advancing British troops. Caught between two military giants, the Acadian settlers were soon to have their tranquil lifestyle destroyed forever. 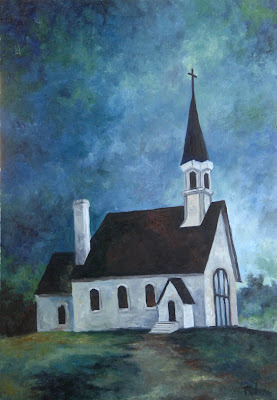 The Church at Grand Pré was the first Catholic Church built in Nova Scotia. The British troops used it as a prison for the soon-to-be-exiled Acadians. Leave Our Homes? Hell No! The British used harsh tactics to subdue these stubborn settlers. Permanent guards were posted at each home, forcing its inhabitants to live for an extended period in the unsheltered wilderness. Final Insult. 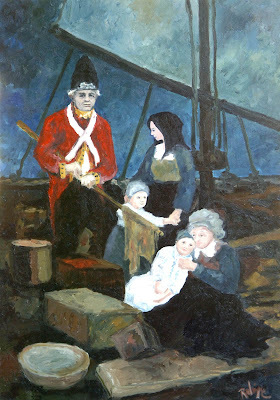 Deported Acadians were forced to endure the harsh winter in open vessels in the North Atlantic. This controversial painting shows a soldier of the Crown offering a diseased blanket as cover for a child. 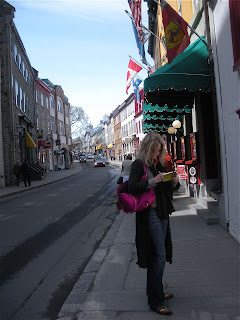 A Final Look at Acadie. Forcibly driven from their homes and separated from those they loved, the stage was set in 1755 for the odyssey to begin and for Longfellow to immortalize this epic journey. The First Cajuns. 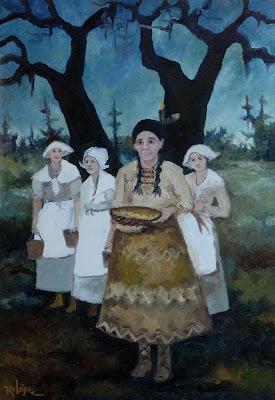 After many years without a homeland, these steadfast Acadians reached their long sought “Land of the Oaks” and became Cajuns. The Last Novena for Gabriel. Evangeline, symbol of forced separation of families, friends and those in love, offers one final prayer for her Gabriel. Return to Acadie. 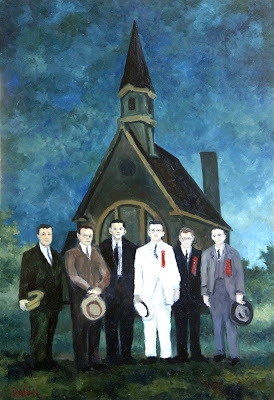 Dudley LeBlanc became the first Cajun on record to revisit his roots: the historic Church of Grand Pré in Nova Scotia. At the time, LeBlanc’s Hadacol was second in America for advertising expenses behind Coca-Cola. 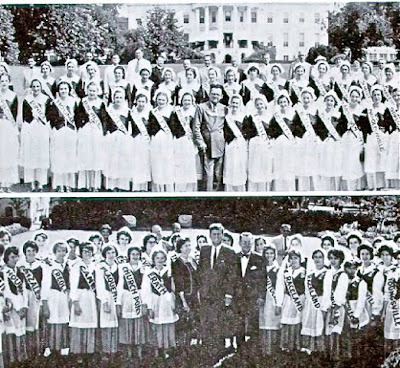 I leave you with a photograph (1960s) of former Louisiana State Senator Dudley J. LeBlanc with his 'Evangelines' at the White House (note President John F. Kennedy in the bottom photo), on their way to the Church at Grand Pré in Nova Scotia. I always wanted to go there and I know the pictures don't do it justice. Can't wait to hear all about it and see pics!! !